not knowing where you might end up. becoming more the person you are meant to be. where you thought you would. especially if you aren't open to the journey. so sweet surprises can find you. aren't those the best adventures of all? 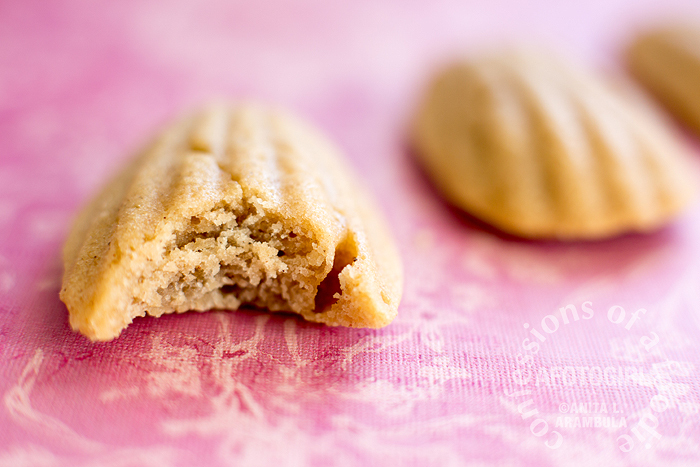 These madeleines were an unexpected sweet surprise. The plan was to make homemade sugar cones with my panini press. With my own modified recipe, I planned on using a technique discovered and perfected by fellow San Diego food blogger Kathy Strahs over at Panini Happy. Filming as I went along (by the by, it isn't easy to hold and shoot a heavy Canon Mark III in one hand while stirring, whisking, pouring with the other) I got all the way to the actual baking of the cone. I was planning on making mini cones for mini drumstix (my semi-homemade solution might make it to the blog next week so stay tuned! ), so I placed a small scoop of the batter on the press in the shape of a log so that the weight of the press would smush it down into a circle. I cooked my little cone for a guestimated time of 90 seconds, the sweet smell bringing back memories from my youth of walking into our local ice cream shop, Niederfranks, when it was still run by the original Niederfranks. I lifted the lid, not quite done but I realized, this wasn't going to work. The grooves on my panini press are simply too deep, the cone between the deep channels too thin to withstand being coaxed into a cone shape. But the taste was delicious. So what to do? Determined still to make cones, I pulled out my trusty commercial lipped sheet pan and silpat. I placed a few scoops of batter on the pan, covered them with plastic wrap so I could flatten easily, removed the plastic marveling at my ingenious save. I baked them in the oven for 6 minutes. Not done. 8 minutes. Drat! Too done. Hmmm. Thinking. Wheels turning. What to do now? A-ha! Lightbulb moment. A few months ago, I bought a pair of actual "Made in France" madeleine pans and hadn't broken them in yet. "Well, what the heck," I thought. So I stopped filming, dug out one of those pans, prepped it, scooped the remaining batter into the molds (just barely had enough for all 12 cavities!) and set the oven timer to 8 minutes. Ding! Ding! Ding! Not set yet. So another 4 minutes then another 4 and finally they were set and JUST starting to brown on the very edges. I had to resist temptation to taste until they were cool enough to flip out of the pan and onto the cooling rack. What a sweet surprise it was. Beat a cup of the heavy cream with the vanilla in a stand mixer on medium high until thick. Set aside. Hand whisk together the sugar, flour, cinnamon and nutmeg in a separate bowl until well combined. Then add it to the cream mixture, gently folding until it's incorporated. Add the remaining whipping cream one tablespoon at a time if the batter is too dry or difficult to mix (I did add all 4). Cover batter with plastic wrap and let rest for 30 minutes. Preheat oven to 375 degrees Fahrenheit if using a shiny silver madeleine pan or 350 if using a dark or nonstick one. Liberally spray nonstick cooking spray onto the pan. 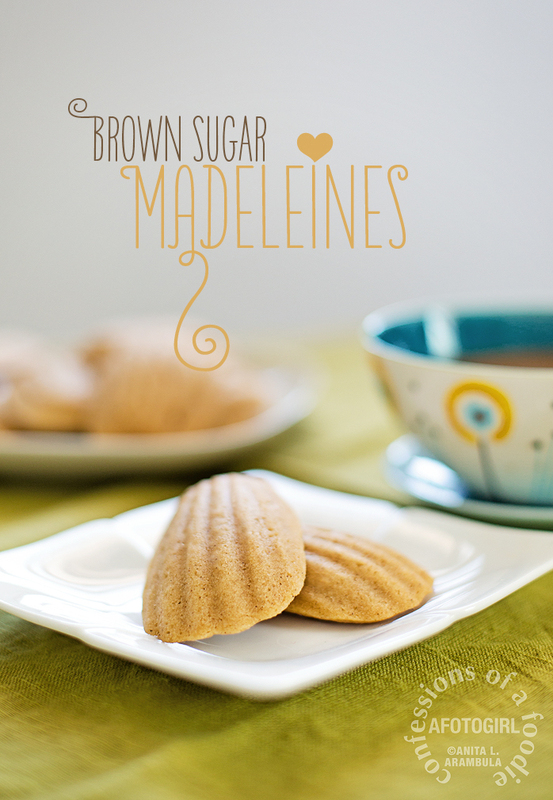 Place a heaping scoopful of batter into each of the twelve cavities of the madeleine pan using a small cookie scoop. Tap pan against the tabletop or counter to help knock out excess air bubbles. Bake madeleines for 16 minutes or until set and a toothpick inserted comes out clean. Let cookies cool in the pan for 5 minutes before carefully flipping the cookies out onto a cooling rack. Enjoy with a cup of tea. Store remaining cookies in an airtight container for up to 3 days at room temperature. Until next time … here's wishing you many sweet surprises! Anita, I just made madeleines for my mom last Sunday! Like, 50 of them. Took some practice. My recipe used a ton of butter instead of heavy cream. I love your video and the music. Your version has warm spices that I love. 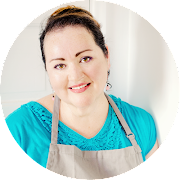 Can't wait to try your recipe!